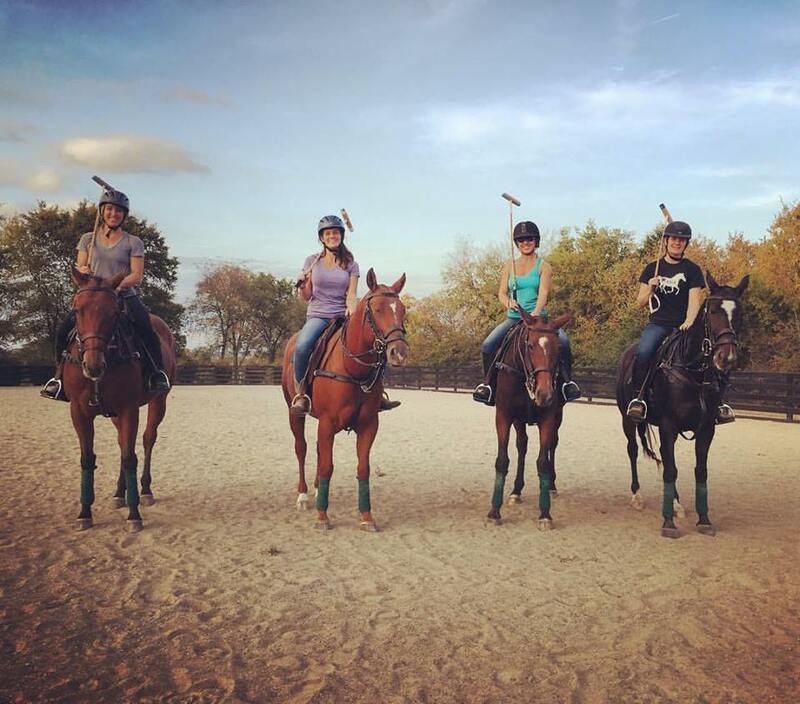 We will be featuring one of our polo ponies each month to share with you a little about their backgrounds and special roles they carry at Franklin Polo Academy. We hope you enjoy getting to know our horses and encourage you to seek them out at polo matches to say hello as they ride by! Or better yet, come take a polo lesson with them! McLovin, or affectionately known as "McMuffin", steals the spotlight for April's Featured Polo Pony of the Month! Muffin is a chestnut, Quarter Horse gelding. He is also our smallest school horse at Franklin Polo Academy, barely reaching 14.3 hands tall (about 59 inches) and also our youngest at 6 years of age. He has a cute white star, partial stripe, and snip on his face, and two hind white pasterns. Stevie Orthwein Jr. plays McLovin in the USA vs. Mexico match in July 2016. Originally owned by FPA co-owner, Stevie Orthwein Jr., you probably saw the pair playing in the Tractor Supply Co. Arena numerous times last year at Harlinsdale. When Muffin came to us, he had recently been transformed into a polo pony after being trained as a ranch horse in Texas. He took to polo very well but because of his young age, we tend to put intermediate to advanced riders on him for the time being. With his small, compact size, Muffin is extremely handy, meaning he is great at stopping and turning faster than other horses. He is a joy to use as a lesson horse since he moves correctly on his own; students can really begin to understand how a polo pony is supposed to move. Muffin spent the winter in Okeechobee, Florida gaining some more polo experience to bring back to Tennessee. He should be back next month and ready for lessons shortly after. *Stevie named him after the character in the movie, Superbad. *He oddly does not like treats like the other horses do. *He is so small, most of our mallets are too long to use while riding him. We hope you've enjoyed learning about McLovin/Muffin and look forward to next month's feature polo pony! Have you had a special moment or the chance to ride him? We would love it if you shared your experience! Comment below or on our Facebook page. Lessons are starting up and our first event at Harlinsdale is just around the corner (June 2nd)! Be sure to contact us if you'd like to participate in either! Email us at info@franklinpolo.com or give us a call at 615-800-2268. We will be featuring one of our polo ponies each month to share with you a little about their backgrounds and special roles they carry at Franklin Polo Academy. We hope you enjoy getting to know our horses and encourage you to seek them out at polo matches to say hello as they ride by! The first Polo Pony of the Month for 2017 is our simple-looking Thoroughbred mare named Nala. Nala is a bay and doesn't have any white markings on her legs but has the smallest trace of a white star between her eyes. She is so quiet that you will often find her napping at the trailer before playing a chukker or being ridden in a lesson. However, if you bring her a treat, this cookie monster will wake up with eyes wide, ears perked forward, and tongue stuck out until you give it to her! Yes, Nala was named after Simba's best friend in The Lion King. We hope you've enjoyed learning about Nala and look forward to next month's feature polo pony! We would love to hear about your personal horses and how they're special to you so please comment!